In 1965, the Canadian psychologist Elliott Jaques coined the term midlife crisis to describe the trauma many individuals in the developed world feel around the age of 35, when they face the imminence of old age and, eventually, death. In the traditional narrative of the crisis, individuals  mostly men  panic and make extreme compensations for this reality: an extra-marital affair, perhaps, or the rash purchase of a Corvette or Harley. But has the concept of the midlife crisis itself grown old and tired? Professor Carlo Strenger, 51, of Tel Aviv University's Department of Psychology thinks so. In a series of articles and studies, he has argued that increasing life expectancy makes the midlife years a time to grow and flourish. He explained his optimism in an interview with TIME. You think the field of midlife studies should be reshaped. Why? 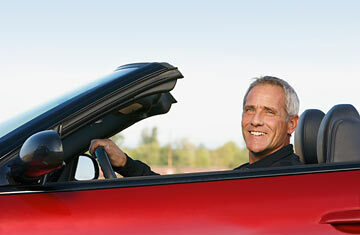 We tend to think of the concept of the midlife crisis as being around for ever, but it's recent. Only 45 years ago Elliott Jaques thought that the midlife crisis started around age 35. Today when you reach 50 you can realistically expect to look forward to as many working years ahead as you have behind you. Our culture has not yet adapted to that new reality. So what does that mean for people who are spooked by growing old? One of the motivations behind the research was that I noticed a disparity between two groups: some people at midlife just begin to dim  physically, intellectually and in their general outlook. But you also have an ever growing number of people who actually go into a higher gear. They often make quite significant changes, they are very vital, they often do their most significant work after midlife. My suggestion is replace the term midlife crisis with midlife transition, and look at it totally differently in order to make the second, vital group the norm. But it's still a fact that at a certain point we will grow weaker, and then sicker, and then die. That hasn't changed, has it? An awareness of mortality usually hits home around midlife as people's parents die. Parents are a sort of emotional buffer between yourself and death; it's not your turn as long as they are alive. But if you realize that in midlife there is a lot of time ahead, awareness of mortality can really be a catalyst for taking more responsibility for your life. What you are saying sounds sensible, but surely it's the same thing Jaques and others would have said 40 years ago? Actually, what you find in the literature of the time is advocating retreating from life after midlife. The message was: "Find your inner self." I don't think we should lower our expectations for the role we can play in the world after midlife. So what does that mean, in terms of practical advice? Most of our major life decisions about careers and family are made when we are in our twenties and early thirties, at a time when our self-understanding is not fully formed. The midlife transition offers an opportunity to make changes. That doesn't mean deciding to drop everything to become a singer, actor or athlete. But it does mean that making changes to your profession or personal life based on accumulated self-knowledge at this stage can be deeply rewarding. I have seen many people who at midlife finally realized how much they had so far been guided by social expectations, and finally began to live the life that they genuinely wanted.